A view of the Andasol 1 and 2, a parabolic through power plants located in Granada, Spain. With a gross electricity output of around 180 GWh per year and a collector surface area of over 510, 000 square meters - equal to 70 soccer pitches - they are the largest solar power plants in the world..Following their construction period of around two years, the Andasol power plants will supply up to 200,000 people with environmentally friendly solar electricity. 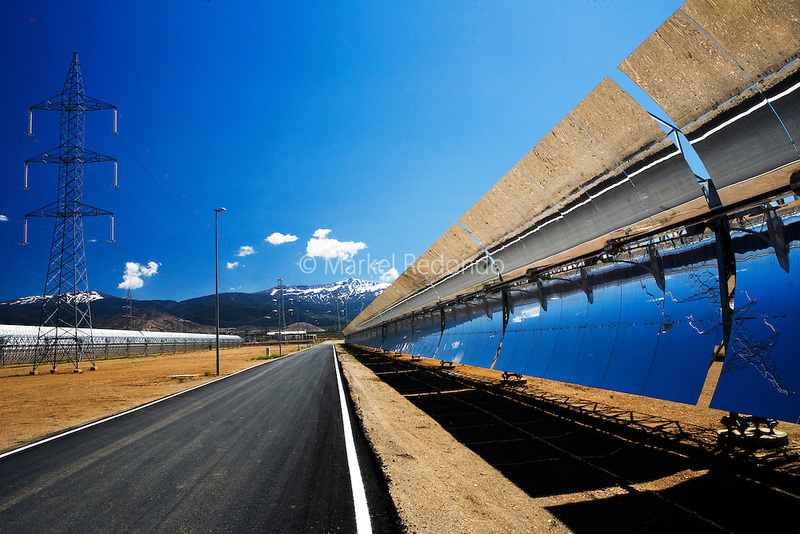 Photographer: Markel Redondo/Fedephoto.com.A view of the Andasol 1 and 2, a parabolic through power plants located in Granada, Spain. With a gross electricity output of around 180 GWh per year and a collector surface area of over 510, 000 square meters - equal to 70 soccer pitches - they are the largest solar power plants in the world..Following their construction period of around two years, the Andasol power plants will supply up to 200,000 people with environmentally friendly solar electricity. Photographer: Markel Redondo/Fedephoto.com for Greenpeace.A view of the Andasol 1 and 2, a parabolic through power plants located in Granada, Spain. With a gross electricity output of around 180 GWh per year and a collector surface area of over 510, 000 square meters - equal to 70 soccer pitches - they are the largest solar power plants in the world..Following their construction period of around two years, the Andasol power plants will supply up to 200,000 people with environmentally friendly solar electricity. Photographer: Markel Redondo/Fedephoto.com for Greenpeace.